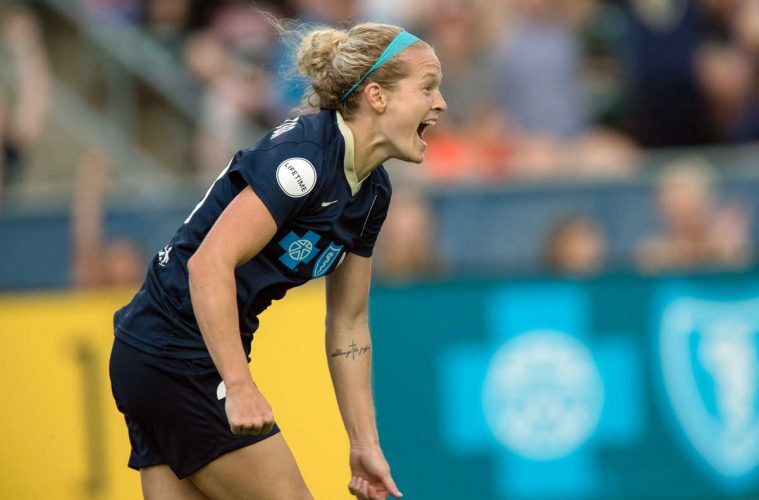 Kristen Hamilton scored two goals in the first 13 minutes of the match to help the North Carolina Courage to a 3-1 win over the Boston Breakers at Sahlen’s Stadium at Wake Med Soccer Park in Cary, North Carolina. With the win, the Courage remain at the top of the National Women’s Soccer League (NWSL) table with a record of 7-3-0 and 21 points. The Breakers, after starting the season well, fall to 2-5-2 and ninth in the table. Like the majority of teams in the league, the Courage and Breakers are juggling rosters to deal with injuries. The Courage were without their strike force of Lynn Williams and Jessica McDonald, as well as defender Yuri Kawamura, who is out for the season after an ACL injury. Ashley Hatch and Hamilton got the starts up top in place of Williams and McDonald while Taylor Smith made another start in the right back position. The Courage lined up in a 4-4-2 with Katelyn Rowland in goal. The Breakers were without Allysha Chapman in defense and playmaker Rose Lavelle, who suffered a strained left hamstring while on duty for the United States during the international break. Morgan Andrews made her first professional start in place of Lavelle, with Megan Oyster returning the lineup after sitting out due to injury. The Courage started quickly off a turnover from the Breakers. Sam Mewis intercepted an Oyster pass and slotted a pass in between the Boston defense to Hamilton, who held her run in behind the defense perfectly and sent a right-footed shot to the far post to put North Carolina on the board in the 3rd minute. Ten minutes later, Hamilton completed her brace to double the Courage lead. Abby Erceg got on the end of an Abby Dahlkemper corner kick to send a header toward goal that ended up hitting the post. The ball popped out of the ensuing melee in front of goal and landed at the feet of an unmarked Hamilton who buried the ball into the back of the net. The Courage were firmly in control of the match and extended the lead in the 38th minute. Makenzy Doniak sent a ball forward in an attempt to feed forward Ashley Hatch. Boston goalkeeper Abby Smith was well off her line and outside of her box to try to clear the ball but ended up whiffing on it, leaving her and her goal exposed. Hatch scooped up the ball and laid it off to Doniak who played it right back to her. Hatch took a touch to balance herself and sent in a left-footed shot into the unguarded goal that a retreating Smith had no chance of saving. Smith was busy on the night and redeemed herself just before half to deny Hatch and keep the score 3-0 to the Courage. It was one of five saves for Smith on the night. Boston cut the lead to two in the 73rd minute after some inside-outside buildup that saw Adriana Leon send a cross/shot in on goal that found the back of the net. The Breakers were unable to add another, however, and the Courage took the maximum points. The teams meet again on Saturday, June 24, in Boston. Stephanie Ochs made her debut for North Carolina in the 87th minute. Ochs signed with the club on June 16 after the Houston Dash waived her. Boston captain Julie King made her 96th appearance for the club, making her second to Kristine Lilly in all-time club appearances for the Breakers.